I attended my grandmother’s funeral this weekend down in San Benito Texas at one of the most beautiful, and coincidentally, most mosquito infested graveyards. I remember both the beauty and the mosquitoes from the September 5 years ago when we buried my grandfather. In fact, tomorrow, the 22nd, will be the fifth anniversary of his death. This time, however, I came prepared. Prepared with a camera to capture the beauty and prepared with bug repellent to protect myself from the blood lusted assault of the bugs. 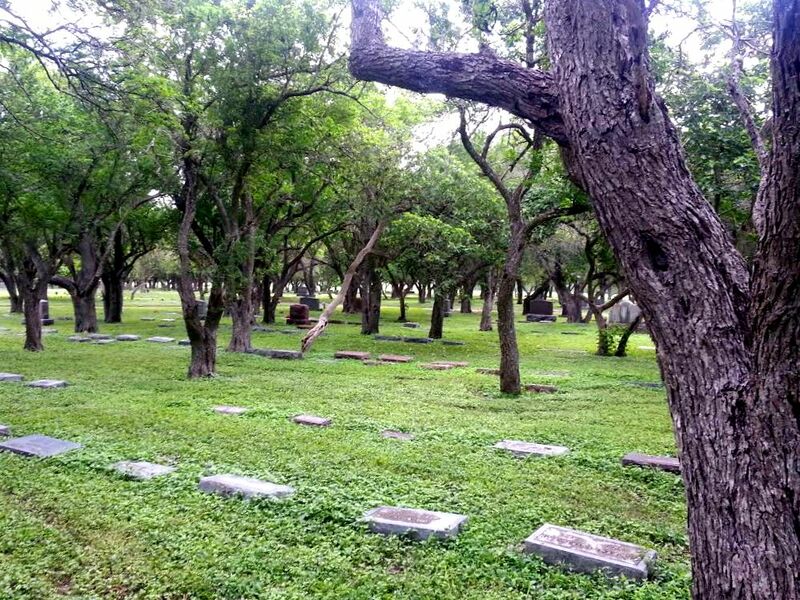 The cemetery boasts green ground cover and mystical Texas Ebony trees which are small, for a tree, and remind me of a bonsai garden. There is also the occasional wild olive tree, currently in bloom. The headstone for my grandparents is spot on for them. Two toasting wine classes and a rose between them. Everyone has continued to comment on the champagne toast my grandparents enjoyed each evening together at sunset. The minister commented that the sunset they’re toasting to now must be ever so spectacular. The funeral service couldn’t have been more perfect. Small, warm, and heartfelt. A giant display of red roses rested upon her casket. Most family members stood up to speak a few words. I was surprised when my father was moved to tears as he described my grandmother holding each of her grandchildren when they were born. This might sound strange, but I haven’t been moved much to sadness over my grandmother’s death. When someone has lived to be 93, lived an incredibly joyous life, has lost their one true love, and is suffering with both mental and physical illness, death is a blessing. The sadness though, that I have felt, has come from the experience of grief I feel for my mother and aunt. I can only speculate, but I think maybe part of my father’s emotion was from a similar place. Thinking about the loss his loved ones were grieving. When someone dies before a “ripe old age”, grief is overwhelming loss and sadness. Grief is… loss of what could have been. For me, when someone who is 93 dies, it’s not the loss of the person that hits me the hardest, but what it signifies. It’s the loss of what has been. A time and age that we can never return to. Regardless of whether you are sure you will be reunited with your loved ones in the afterlife, you cannot regain this life back. It is a reminder of my mortality. A reminder of the mortality of those I hold dearest. The finality of a time and age. A reminder of the memories we created together- memories that I wish I could relive. My childhood in their backyard swimming pool. The smile my grandfather had every time I came through that back gate by their garage. The sound of their doorbell. My youth, my own parents’ youth. Time is passing and I can’t slow it down. So, I cry for my mom, and for her siblings. I cry because it was her mom. I know what it’s like to have a mom. I love mine with all my heart. I have been so blessed to have her play such an integral part of my life, and my own child’s life. When I imagine saying goodbye permanently to making more memories with my mother, it’s too much to process. I hope I will be so lucky to have her for many more years to come. Regardless of how old your mother is when you lose her, she’s still your mother. She never stops being your mom. And whether it was before her time, it was her time, or far beyond her time, it’s a loss. 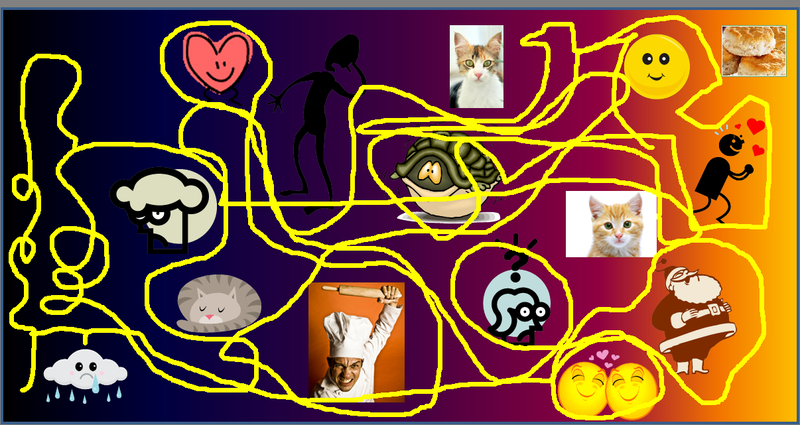 When I was going through a period of grief at one point in my life, I created this map of what grief felt like to me. I think there is this sense in society that we heal in a linear fashion. Getting better and better each day. But grief to me felt like a spaghetti bowl of twists and turns and knots. Just when you thought you were at the end of it, it turned back around and took you for a spin. I learned to have compassion for my emotions and process. We should do that for each other too. Lay down our expectations and accept what may come and what may not. Accept the unique path of your own grief.